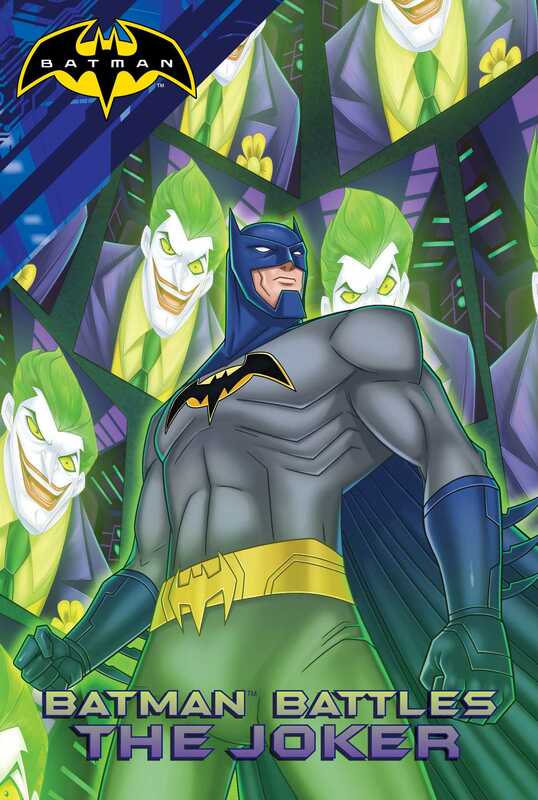 Gotham City’s spookiest villains are working together, and only Batman and his superhero friends can stop them in this action-packed chapter book retelling of the Monster Mayhem Batman animated film with full-color illustrations throughout. It’s Halloween night in Gotham City, but Batman isn’t getting any treats. A crime spree has Batman on the trail of the city’s spookiest villains: Scarecrow, Clayface, Silver Banshee, and Solomon Grundy. They are all working for the Joker, who wants to unleash a computer virus and “digital laughter” that will give him control over all of Gotham City’s technology! Joining forces with the Green Arrow, Cyborg, Nightwing, and Red Robin, can Batman save Gotham City? Find out in this thrilling chapter book with full-color interior illustrations! In the dark of night, two evil inmates escaped from the Arkham Asylum and ran to freedom . . . to the streets of Gotham City. Usually, people would take one look at Solomon Grundy and Silver Banshee and run the other way, but tonight was different. It was Halloween. People thought they were wearing costumes, just like everyone else. A man dressed as a rock star bumped into the massive Grundy, took one look at him, and said, “Zombie wrestler! Nice one!” before walking away. “Grundy love Halloween!” Grundy told Banshee. They were standing in the middle of the street when a red convertible drove up, full of people dressed like super heroes. “Get out of the street!” said the driver. Grundy lifted the car and dumped its passengers onto the street. Then he and Banshee jumped into the convertible and drove off. Soon police vehicles chased them with sirens screaming. Silver Banshee screamed back. Her sonic blast hit the police cars like a sledgehammer and made them crash. Nightwing and Green Arrow noticed the chase from a rooftop and took action! Green Arrow shot an arrow at the stolen car, which made Grundy, who was driving, lose control. Banshee launched a sonic blast back at Green Arrow. “Jump!” Nightwing yelled to Green Arrow. They escaped the blast just in time! That’s when the Batmobile joined the chase. Red Robin used the car’s computer to find out who was driving the convertible. “Positive ID. It’s Solomon Grundy and Silver Banshee,” he said. “Let’s see if they want a trick or a treat,” the Dark Knight said as he drove in front of the villains’ car. Grundy made the convertible take a sharp turn to escape. That’s when Nightwing dropped down from a rooftop into the backseat. He fought Silver Banshee as Green Arrow drove up on his motorcycle! They all sped toward a tunnel, with Batman and Red Robin close behind. Once Grundy, Banshee, Nightwing, and Green Arrow had made it inside, Banshee used a sonic scream to collapse the entrance so the Batmobile couldn’t enter. “Now what?” asked Red Robin. The Dark Knight pushed a button on the dashboard of the Batmobile. The front of the car opened up, and a huge drill began to cut through the rubble. Inside the tunnel, Nightwing and Green Arrow were hit by sticky green globs of goo. “No!” Green Arrow shouted as the goo erupted into Scarecrow’s fear gas, knocking the heroes unconscious. Scarecrow came out from the shadows. He was furious with Grundy and Banshee. Grundy and Banshee looked glum as Scarecrow took the driver’s seat. They sped out of the tunnel, leaving the heroes behind. Soon after, Batman and Red Robin made it into the tunnel. Nightwing and Green Arrow were just beginning to wake up from what felt like a nightmare. “There’s residue from Scarecrow’s fear gas,” the Dark Knight said. It sounded like the nightmare was just beginning. While the real-life Batman battled super-villains on the streets of Gotham City, video game designer Gogo Shoto was using a virtual-reality game he invented to pretend to be Batman. He was fighting virtual villains when his secretary interrupted him. Well, he thought it was his secretary, but then she tried to punch him, and her fist went through the wall. WHAAAAM! Shoto fled to the computer core in his office and sent out a digital distress call. Batman saw a giant Bat-Signal on an electronic billboard and arrived just in time to see the secretary turn into a giant blob of clay: Clayface! Before Batman could stop him, Clayface stuffed Shoto into his gooey body, sprouted pterodactyl-like wings, and flew out the window. Batman deployed his glider cape and followed close behind, but Clayface escaped down a manhole with Shoto.